Kevin and Caroline couldn’t have picked a lovelier day to get married. The sun was shining and flowers in were bloom on their April day in early Spring. We love how Olivia from Nancy Ray Photography captured the details from their day! As guests arrived to the couple’s hometown of Winston-Salem and settled in for the weekend, they were treated to a beautiful custom gift box filled with Kevin and Caroline’s favorite treats, a handy weekend essentials kit, and promises of fun events to come. On the wedding day out of town guests arrived to the affair in style, on a historic trolley. The couple had a beautiful outdoor ceremony at the historic Brookstown Inn in Winston-Salem, North Carolina. 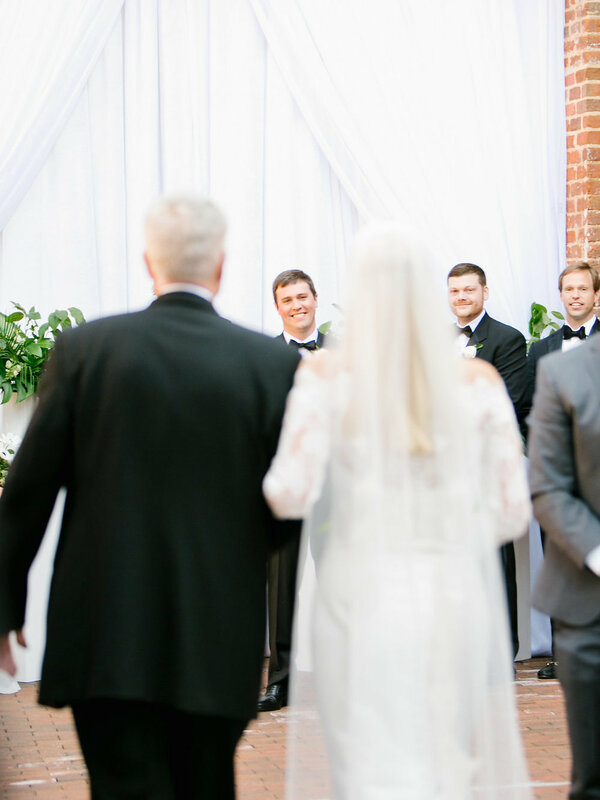 Guests were greeted with butler passed champagne and string musicians played as the wedding party walked the brick aisle. 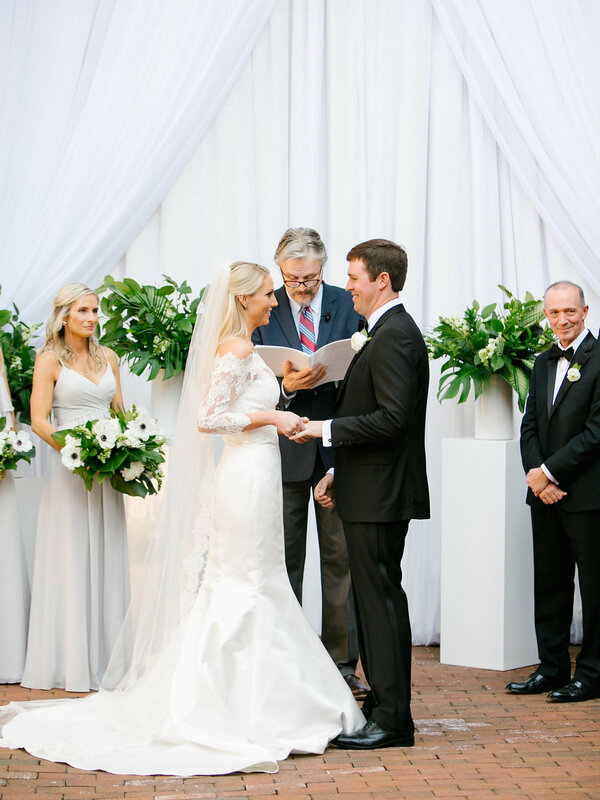 The backdrop for Kevin and Caroline’s vows was a custom outdoor altar we created with soft white draping and stunning floral details. The bridesmaids wore soft grey dresses that were the perfect contrast to the groomsmen’s classic tuxedos. After the ceremony, guests were treated to delicious butler passed hors d’ oeuvres under the historic bridge. Guests listened to contemporary covers played by the string musicians and were teased with glimpses of Kevin and Caroline’s beautiful wedding cake adorned with peonies and gold accents. Inside the ballroom, the party kicked into high gear as the band played the couple’s favorite songs. Abundant candlelight filled the room. Warm Krispy Kreme donuts were served on the dance floor. At the end of the evening Kevin and Caroline, left under the glow of sparklers in a beautiful classic car. The entire wedding day was a perfect reflection of this couple with a classic neutral color palette, unexpected uses of fun tropical foliage such as monstera and robellini palm leaves, and sparkly gold accents galore. We couldn’t be happier for Kevin and Caroline and wish them a world of happiness to come!